Have you ever worked under other names? Please read carefully and sign. I certify that all information contained in this application is true and complete and I understand that any misrepresentation, falsification or willful omission shall be sufficient reason for refusal of or dismissal from employment. In consideration of my employment, I agree to conform to the rules and regulations of Creekside Pet Center. I understand that this application does not represent an offer or contract for employment. 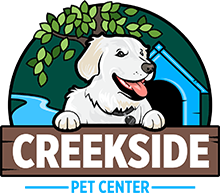 I understand that employment with Creekside Pet Center is “at will” and employment can be terminated without specified notice or reason at any time at the option of either Creekside Pet Center or myself. I understand that if considered for employment, I will not be hired until I have passed a pre-employment drug/alcohol screen and/or medical examination. I hereby consent to undergo a drug/alcohol screen and/or medical examination as part of my application for employment at Creekside Pet Center. Further, I authorize the hospital, clinic and/or testing facility to release to Creekside Pet Center the results of such examination and testing and I release Creekside Pet Center, its doctors, medical personnel and the testing facility from any and all liability arising from the release or use of this information. My signature also authorizes Creekside Pet Center to review my previous employment (except where indicated), driving and criminal records and/or background data as it may relate to the positions for which I am applying or have been hired. My signature also authorizes my previous and current employers to release to Creekside Pet Center any information they may have regarding my employment record. Applications not signed will not be considered.